Were there other sorts of needle pushers besides thimbles? Yes! Sail makers, leather workers, tent makers, and probably others, used various sorts of “palm pushers” to force their needles through the thicker and more dense layers of cloth and leather. Remember, industrial sewing machines did not become available until the 1800’s. 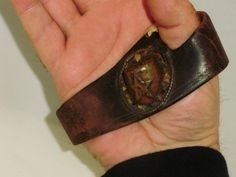 Like this modern sailmaker’s palm, the pushers had pieces of metal, often lead, which survive archaeologically. Here is an antique sale maker’s palm from Maine. Remember, antique does NOT mean historically accurate. And if you are wondering how they are placed onto the hand, here is another picture. As with broken pieces of thimbles and thimble rings, the rather lumpy bits of metal that are used in the palm pushers are hard to identify. But a quick search in the Portable Antiquities scheme produces lots of metal from palm pushers. Random pieces of lead or bronze are often designated as “palm pushers”. This example is a good one, even if the shape is not typical. 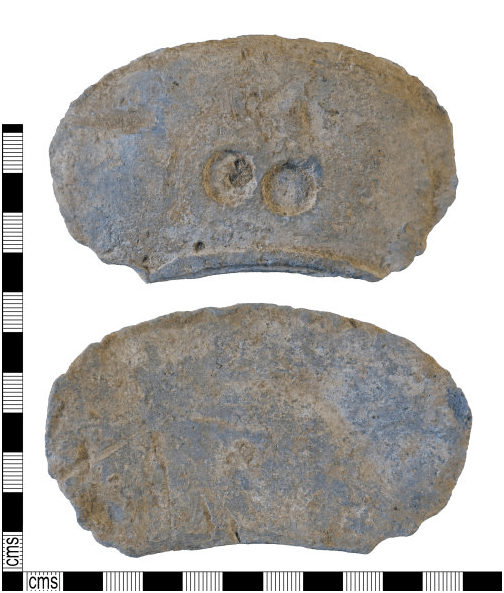 Most of them appear to have been cast in the bowl of a spoon, and are therefore more spoon shaped, but this one is well preserved enough to show the two depressions on the one surface. The other side (the back side) is plain. To see how a modern sail maker’s palm is used, here is a video from a company that sells them. And just in case you want to make your own, here is an Instructable about how to make one. So where does this leave us as re-enactors? 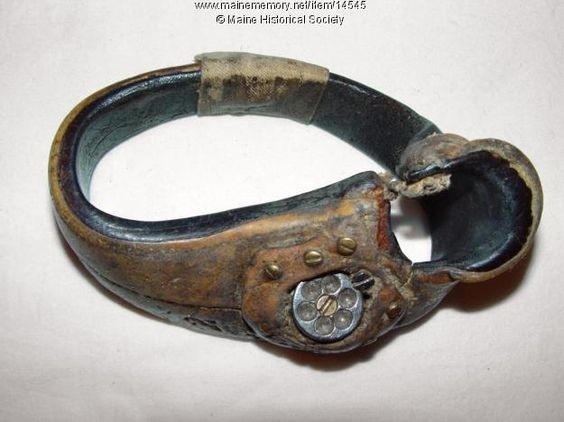 Well, as a re-enactor specializing in pre-1600 studies I would be tempted to just use a thimble ring. That would be “safe” for just about anywhere, except the Romans. And what strange side trips has this line of research taken me off on? Well, probably the oddest was this one. And it is an excellent example of why we should not jump to conclusions about an item, based solely on a picture. I was searching through Google Images, and this picture popped up. I was looking for good pictures of Hispano-Moresque thimbles, which actually look a lot like this in shape, but the decorations on these were obviously Pictish. There is no indication of size in the pictures, but fortunately the title along the bottom gave it all away. 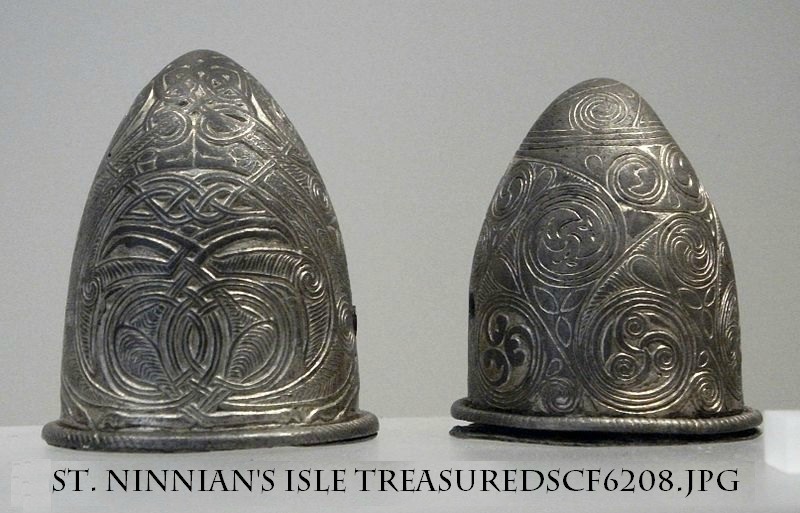 These are part of a Pictish hoard, found in Scotland, containing silver and silver gilt, and they are mounts – decorative pieces, possibly from a sword or knife handle, and they are waaay to big to be used as thimbles. 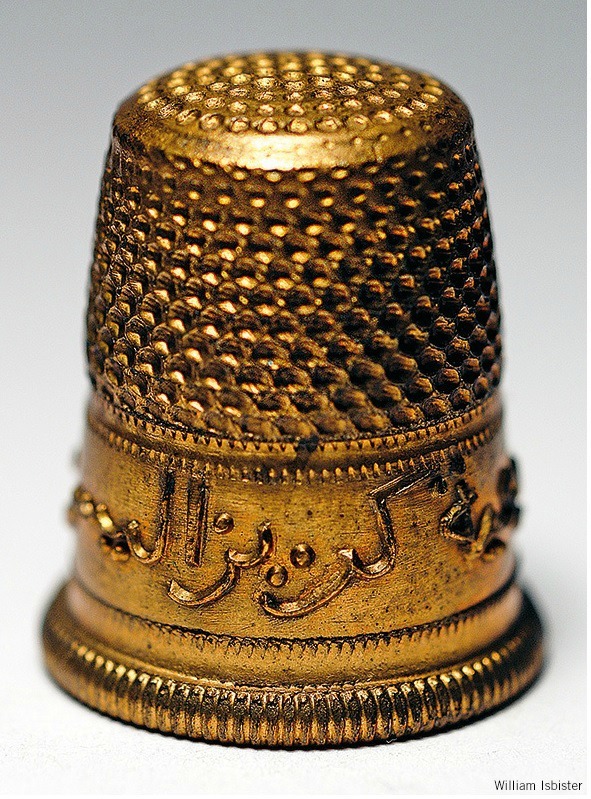 And then there was the modern Arabic thimble, that so easily could have been portrayed as something of greater antiquity. The form is modern. The dimples are too regular and the decorative band on an earlier thimble would have been engraved, rather than having raised letters. But the clincher is the meaning of the Arabic: Wrinkle Free Natural Silk Textiles. Not exactly a verse from the Koran. And another odd bit? Seeing my own pictures of thimbles, from my collection, show up on Google images. It sure didn’t take them long to grab them! I hope that this brief survey has been helpful to all those who enjoy sewing and the humble, but immensely useful, thimble.